The Texas Jury Trial - What Should I Expect? The Texas Jury Trial - What Should I Expect? No Cost Unless You Win! We’ve all heard these words on countless episodes of Law & Order, or at the movies, but have you ever wondered what really happens in a Texas jury trial? The lawyers stand, usually the attorney for the Plaintiff (the complaining party) first, and provide the jury with a road map of the evidence they intend to present during the trial. Often the lawyers preface their sentences in these statements with phrases like “The evidence will prove…” or “Witness ‘A’ will testify that…” This is often thought of as “opening argument” but it isn’t in fact argument. It’s supposed to be a sort of introduction to the evidence. Most lawyers will use it as an opportunity to begin arguing though, but their argument won’t be a verbal fight, it will be an exercise in the art of persuasive rhetoric. After opening statement, the Plaintiff will be asked to call their first witness. The Plaintiff’s attorney will call a witness and begin what is called “direct examination” when the Plaintiff’s attorney has finished with this, he or she will “pass the witness,” and the Defense attorney will engage in “cross examination” of the witness. Then there will be a “re-direct” and a “re-cross.” Ultimately, the witness will be excused, and the Plaintiff’s attorney will call his or her next witness. This will continue until the Plaintiff has finished calling all of his or her witnesses and entering all of his or her documentary evidence. 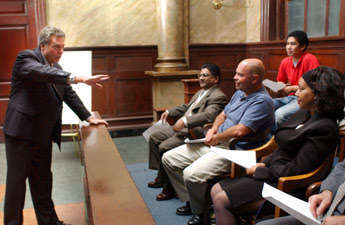 Then the Plaintiff will “rest” and the Defendant will begin his or her presentation of evidence. After both sides have finished presentation of evidence, the jury will be asked to retire, and the lawyers and the judge will confer over the jury charge. This is the document that will instruct the jurors as to what they must do in order to find for one side over the other. In a negligence suit in Texas, the jurors are asked questions like this: “Did the negligence of Defendant proximately cause the occurrence or injury in question?” Terms like “negligence” and “proximate cause” will be defined in the charge too, so the jurors will understand them. After the charge has been read to the jury, the lawyers will make their closing arguments. This is where a Plaintiff’s lawyer will engage all his or her persuasive skills to attempt to tie the evidence together in such a way so as to convince the jury that the Plaintiff was injured as a result of the Defendant’s negligence, and that the Plaintiff’s injuries are worth some amount of money. The Defendant’s attorney will argue that the Plaintiff didn’t cause the injury, or that the injury is not worth as much as the Plaintiff is asking for. After the closing arguments, the jury will retire to deliberate and reach a verdict. After deliberations have concluded, and the jury has made a decision, it will return to the courtroom and deliver it’s verdict in open court. Sometime after the jury has delivered it’s verdict, often a few days or weeks later, the court will enter judgment on the verdict, after applying offsets or adjustments to the jury’s verdict that the jurors did not hear about, so as to increase or decrease the value of the verdict. CALL US TODAY TO MAXIMIZE THE VALUE OF YOUR PERSONAL INJURY CLAIM. 214 575 6060. WE ARE DALLAS PERSONAL INJURY LAWYERS. WE KNOW TEXAS INSURANCE. WE KNOW TEXAS LAW. WE FIGHT FOR YOU. DON’T SETTLE FOR LESS. Or Fill Out The Form Below & We’ll Contact You! Where (city or county) did your accident happen? Did your accident happen at work? Did your accident happen at an intersection? If so, what were the intersecting streets? Do you have a police incident report number? Was the other driver insured? If so, with which insurance company? If so, do you have a claim number, and what is it?